The best way to approach outdoor lighting companies is to first do your homework. Oudoor lighting companies may employ all of their own designers or may contract with designers that can perform the work on behalf of their company. Hiring a company that contracts with lighting designers is not a bad thing. These contractors will want to do a good job so that they will continue to receive referrals from the lighting company that hired them. Who knows, if they make you a happy customer, next time you might decide to call on their services directly and cut out the middle man. Let your voice be heard. Which outdoor lighting companies have you had great experiences working with in the past? Or, which companies will you never want to work with again? Rate your experiences and share your story by writing a review. 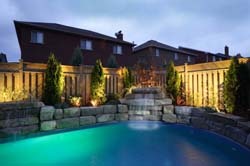 Do you have photos of projects outdoor lighting companies have performed for you? Great! Click the button and find the first one on your computer. Select it and click on the button to choose it. You can upload up to 4 pictures or graphics. Upload your first picture, then click on the link if you want to upload up to 3 more images. The maximum image size accepted is 800x600. Photos larger than 800x600 pixels can use a web based resizer such as Picnik.com. Reputable outdoor lighting companies will not only plan your outdoor lighting layout but will organize and coordinate the construction and installation of it as well. If you decide to choose your own lighting designer, she will be responsible for organizing and planning your outdoor lighting design. Doing so gives you more control since you can then select your own electrical contractor and landscape architect if needed. Finding a local outdoor lighting company is easy. Search the internet to find outdoor lighting companies in your area. Its amazing what you'll find online. Go to a local lighting shop. Anywhere that specializes in lighting can often provide you with lighting services such as design and installation help. If they don't, no worries. Ask them if they could recommend an outdoor lighting company. First off, please know that most lighting companies are legitimate and will do a great job for you. Their success is based on your positive feedback, so they won't want to ruin your relationship. Unfortunately not all companies are honest so you need to know what to look for before hiring a company. If you know what company you wish to hire and feel comfortable dealing with them, that is perfectly fine. Even if you think you know them, Its always best to do a little background check on any company you plan on hiring. Search the internet for their name. Do they have any bad press? Check them out on Facebook and see who they really are. Sometimes you will search the internet for a company that appears to be legitimate but turns out to be a sham. Remember, a company's brand is only as good as the work that they perform and the value they provide. When researching a lightin company, ask to see a portfolio of projects they've completed. They should be able to show you pictures of what they've done. Don't shy away from asking them for references. These references will be the names and contact information of the customers they've done business with in the past. They should be happy to provide you with customers' names and phone numbers. You should feel comfortable contacting those customers to get a feel of their experiences dealing with the company in question. If they're hesitant to provide this information take a mental note and consider looking to do business elsewhere. Find out if the lighting company contracts any of their electrical work to outside contractors. If they do, make sure you ask who their partners are. For example, if they contract their electrical work to an electrical company, ask to know if the electricians performing the work are properly licensed. I've found that some local municipalities will have a list of licensed electrical contractors and the status of their licenses right on their website. You can start your seach by looking at your county clerks department. Some counties require your electrical contractor to go through an application process, pass an exam, and show proof of insurance. Getting an estimate for the work is the first step you'll take. Always, make sure to get at least 3 different estimates from 3 different companies. All estimates should be in writing and should include a few key pieces of information. If you find that the company doesn't include their physical address ask them why and where their offices are located. If they don't have an office, it might be time to start looking elsewhere. Professional outdoor lighting companies will lay out the process right from the start. Pay attention because here is the single most important thing you'll need to know before hiring an outdoor lighting company. GET ALL THE DETAILS IN WRITING! Thats it! Make sure they write everything down. If its not written its not valid. So what exactly should be included in writing? I knew you would ask. What Specific Work is Going To Be Performed? What Prep Work Is Included? When Will The Work End? What Type & Quantity Of Materials Will Be Used? Getting your outdoor lighting project started is exciting but make sure you do the necessary research so that you don't get burned. The extra effort will save you a world of aggrivation.